Welcome to the Woodbury Library! This place rocks. It is the heart of the school. At times, students come to library for lessons through their ELA classes. At other times, teachers book research days in the library. Students also drop by to borrow books before school, during lunch, and after school. The beautiful space is packed with computers, including a Chromebook cart. Mr. Dwyer is our Book Master. He runs Star Wars Book Club and the 3D Printing Club. There's always Nevada Reading Week, Book Fairs, Poetry Jam, Bristlecone Storytelling Festival, and so much more. Stay tuned: all sorts of awesome things are happening in the library! The Book Fair will be awesome! It will run October 22-31. ELA classes will have scheduled visits. The fair will also open before and after school on most days. In addition, it will run during both lunches. This year's theme will be Enchanted Forest of Books! Visit our online calendar. The Woodbury Library Media Center features popular titles of electronic books, commonly referred to as eBooks. eBooks are interactive digital copies of print books. Students can interact with text by highlighting key passages, searching by keyword, taking notes, and finding information with the built-in dictionary. They even have digital bookmarks. These books can be enjoyed in school or at home through most devices including a Windows or Mac computer, Kindle Fire, Nook tablet, Chromebook, iPad, iPhone, Android phone, and Android Tablet. Follett's Destiny Discover is the program that students and teachers use to borrow from our growing virtual collection. eBooks cannot be lost, stolen, or damaged. They are never returned late and if that's not enough, some of these eBooks will even read to you. eBooks can be enjoyed at school or home, 24 hours a day, 365 days a year! Optional 3) Will the school's eBooks work on my device? Our school community has an important relationship with our public libraries. 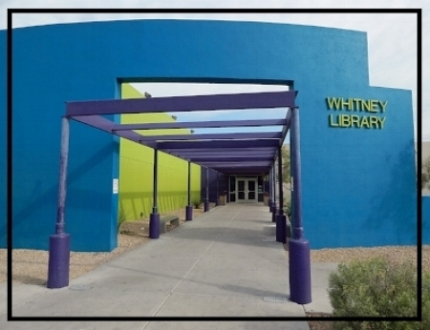 Our local public library is the Whitney Branch of the Las Vegas Clark County Library District. It is just east of Nellis Boulevard on Tropicana Avenue. The library offers friendly staff and free resources including weekly story times for children, public computers for children and adults, wireless Internet access, a monthly book club, a private study room, a separate teen area, and ongoing ESL classes. The library also has a 520-square-foot conference room available for rental, a used bookstore, and an art gallery with regularly changing exhibits. The collection includes books, CDs, and DVDs in a variety of formats and languages, as well as a knowledgeable reference staff which includes the great Erin Collins. The Whitney Library strives to be this community’s access to information, enlightening programs, homework help materials, and a gathering place with a warm welcome for all. Do you do Twitter? So does our library! Book Master Dwyer's Woodbury Library Twitter handle is Book_Master_555. It's a great way to stay up-to-date when it comes to what's happening in our library. You can visit the Woodbury web site's Library Twitter Page and read the tweets. Do don't even have to have a Twitter account to read the tweets. The Force is with us! Last year, the library hosted a "Wonder" Book Club, reading R.J. Palacio's beloved book. This year will witness the rise of Star Wars Book Club as we begin reading "A New Hope." We'll meet to discus the previous week's reading and do activities. Talk to Book Master Dwyer for details. One of the clubs that Book Master Dwyer offers is 3D Print Club. In this club, you learn how to design objects using CAD (Computer Assisted Design) software. Then, you get to print your design using the library's 3D Printer. Finally, you can sand and paint the object. All you need is imagination! This club will start-up as Star Wars Book Club finishes. For more details, visit the 3D Print Club web page. Poetry Jam is a CCSD program that runs out of the library during lunch time. In the Spring, students get to bring their lunches to the library and eat. Afterwards, they explore and celebrate the reading, writing, and performing of poetry. Poetry Jam ends when participants create and perform their own poetry. Our school champions get to tell their poems at the regional Poetry Jam event which is hosted by our friends at the Whitney Library. This school year will witness the introduction of a program that is long running within the CCSD, but new for Woodbury. It is the Bristlecone Storytelling Festival. With this program, students will learn how get in front of people and tell stories that originate from library books. Storytellers will learn about public speaking dynamics such as body language and voice. This will run out of the library during lunch time. There will eventually be a school-wide festival and leads up to the regional event. It will be fun!